If it is hard to loosen the tire holddown wing bolt by a hand, you can loosen it easily using the Jack handle. 1. Put the Jack handle (1) into the inside of tire hold-down wing bolt. 2. 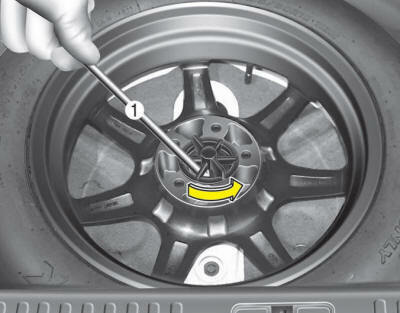 Turn the tire hold-down wing bolt counterclockwise by the Jack handle to utilize the principles of the lever and fulcrum. 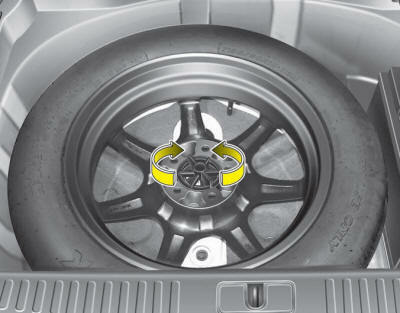 When you remove or store the spare tire, do not contact or bump the battery with the spare tire. Contacting or bumping the battery may cause failure of electrical circuits.